Or, an Eagle displayed Sable beaked, langued and membered Gules, escutcheon Or, on a pale Gules three Chevrons Argent. "In 1011, Rudolph III of Burgundy presented a Novum castellum or new castle (Old French neu, now neuf and Old French châtel, now château, in antiquated German: Welschen Nüwenburg or Newenburg am See) on the lake shore to his wife Irmengarde. It was long assumed that this new castle replaced an older one, but nothing about its location or design is known. At the time of this gift Neuchâtel was probably the center of a newly created royal court, which was recently developed to complement the other royal estates which managed western estates of the Kings of Burgundy". (This was the official starting point of the commune (ville), thus celebrating in 2011 its 1,000 years of establishment). "100 years of life and bounces It’s in 1011 that the term 'Novum Castellum' appears for the first time in a donation of a King of Burgundy to his wife; even though this new castle is called "regalissima sedes" (royal estate), it probably is quite modest. The few houses at the foot of the castle that accommodate the garrison form the embryo of the future city of Neuchâtel." They have two commemorative flags to celebrate the 1,000 years. 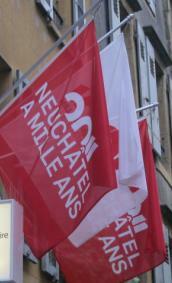 They are both horizontal flags, they show the year 2011 (split showing the upper half of the writing, on top of "Neuchâtel / A mille ans" in upper case letters. One version is red background with white letters, the other version having both colors inverted.